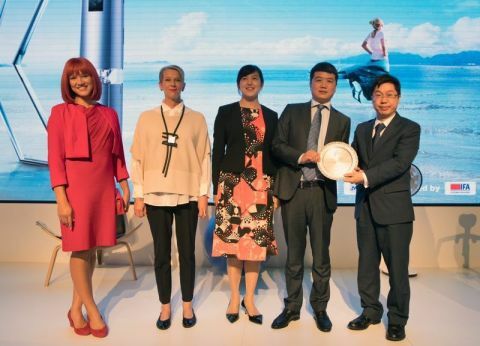 In celebration for Midea’s 50th anniversary, Midea Residential Air Conditioner Division (RAC) of Midea Group, a world leading technologies group, launched an innovative microclimate management device “AirX” and announced the Edge Interaction Intelligence (EII) specification standard together with Qualcomm at IFA2018, Berlin, Germany on August 31st. Air X obtained the Product Technical Innovation Award for its brand new concept of indoor environment adjustment and environmental simulation. This remarkable air conditioner carries the most sophisticated room air quality monitoring system, offering consumers with intuitive room air quality control in various aspects. It is the first device in the world that will adjust temperature, humidity, air flow, cleanness and freshness as a group to provide users the most suitable and comfortable indoor air experience. With twin air outlets, the Breezeless Mode achieves a comfortable feeling of wind. Outdoor fresh air importation allows it to simulate the natural air and provide customers with the most comfortable and customized fresh air experience at home. Moreover, supported by the microclimate simulation system, Air X can interact those 5 different air properties as one group so that users can enjoy breathing the crispy air of New York Central Park or listening to the call of the ocean. Midea also announced the Edge Interaction Intelligence (EII) specification together with Qualcomm Technologies, Inc. As an extension of the Midea M-Smart specification, the EII standard is designed to support different categories of smart home appliances communication without using the Internet. It will not only support Midea home appliances, but also support devices across different brands and categories, ultimately bringing innovative devices and services to consumers. The M-Smart-EII was specifically designed for the smart home appliances to help facilitate device onboarding and interoperability. Midea has selected Qualcomm Technologies to be the first company to support the M-Smart-EII with its control and automation platforms. It’s believed that AirX, as the world’s first microclimate home air conditioner, will show its epoch-making impact once it hits the market. Together with EII and other intelligent technologies, Midea will not only improve the consumers’ indoor air experience, but also will play a positive role in upgrading the air conditioner industry to a smarter and more comfortable era.